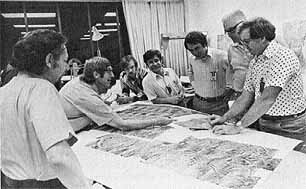 Hal Masursky (above) on 12 July 1976 explains the geology apparent in the P22 photos. Jerry Soffen stands on his right. Across the mosaics, standing from right, are Tom Young, Jim Martin, Carl Sagan, Mike Carr, and an unidentified participant. Photo taken by Hans-Peter Bieman. Target for Viking 1 in Chryse Planitia at 22.4°N latitude, 47.5° longitude is shown in a photo taken 17 July. The area, photographed from 1551 kilometers away, is a smooth plain with many impact craters. Cydonia (B.l, 44.3°N, 10°) had been chosen as the Viking 2 prime site because it was low, about five to six kilometers below the mean Martian surface, and because it was near the southernmost extremity of the winter time north polar hood. B-l also had the advantage of being in line with the first landing site, so the Viking 1 orbiter could relay data from the second lander while the second orbiter mapped the poles and other parts of Mars during the proposed extended mission. While this was a good spot to find water, * Masursky was worried about the geology of the region. He asked David Scott, who had prepared the geology maps, to work up a special hazard map for B- l. After studying the map, Masursky came to the conclusion that the area was not "landable," This analysis, of course, was made with maps based on Mariner 9 photographs. He told Tom Young and Jim Martin, however, that there was one hope; wind-borne material may have mantled the rough terrain and covered "up all those nasties we see." The first picture of the Viking 2 site were not very promising. 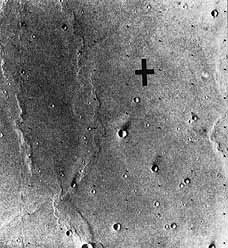 Photos of the preselected primary landing site, Cydonia, were obtained 28 June by Viking I orbiter cameras from a range of 2050 kilometers. The rim of the crater Arandas is on the right edge. Rocks outcrop in the inner well, and ejecta form a lobate pattern with surface ridges and grooves. Small pedestal craters may have been caused by impact and etched out by wind. The center of the left photo is at 43°N latitude and 7.6° longitude; the right, 42.4°N latitude, 7.3° longitude. A suitable landing site had still not been found in B-l when Viking 2 went into orbit on 7 August at 5:29 a.m. PDT. Project strategy now called for using the second orbiter in the search for a site at Alba Patera (B-2) or Utopia Planitia. 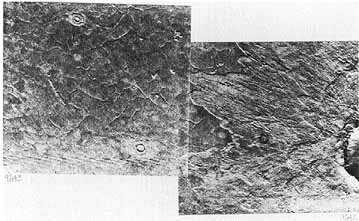 Masursky and Crabill noted that coverage of Alba Patera during P4 and P7 ** "raised and then dashed hopes that it would prove to be a suitable landing site," On revolution four, the photo calibration sequence indicated a possible site in the northern region of Alba where Masursky had located his first ellipse using Mariner 9 images. As Young and Masursky watched the P7 pictures come in on the digifax machine, the region still looked smooth. Thinking they had found a likely prospect for a landing zone, they decided to get more pictures during the 15th orbit. 60 During the night, the mosaic team pasted up all the P7 photos, and Masursky was shocked by what he saw. Where the individual photos had shown a smooth terrain, the mosaic revealed a territory that was "rougher than hell.'' The difference was in the computer processing; under the proper processing, the region appeared very rough, covered by textured lava flows, Masursky thought to himself, "I think we've got a problem." He called for a special meeting of the landing team on 17 August. In their report in Science , Masursky and Crabill evaluated these areas. The dunes in the B-2 region appeared to be bigger and apparently thicker than those in B-3. In B-3 there seemed to be some favorable aeolian mantle, even if it showed signs of being pitted. The northern part of B-3 looked better; cracks became shallower and craters were less abundant. Because of defects in some of the B-2 photos and an atmospheric haze that had obscured the surface, the interpreters were cautious in their estimates of the dunes in that zone. 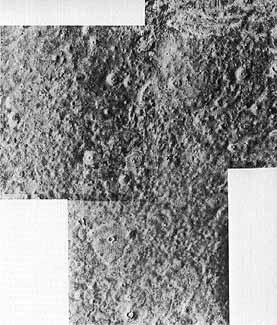 Some of the photogeologists believed that the decreasing number of small craters in B-3 would continue down to the scale of the lander. Some felt that the B-2 craters and ejecta blocks, being smaller than those in B-3, were better covered by B-2's bigger dunes and that B-3's smaller dunes might not cover the ejecta from the larger craters there as well. Still others favored site B-3 because they thought it appeared smoothed by uniform mantling. It was Tom Young's opinion that, although the geological conditions at B-2 east and B-3 west were different, the hazards gave them about the same safety ranking. Continued discussion at the meeting on 21 August centered on the size of the block hazards that they might encounter. Their best analyses predicted that the wind-borne mantling material was sufficient to cover the small blocks thrown out of the craters by meteoritic impact. In the region of the crater Mie, it was hard to project what size blocks could be anticipated. Rocks up to 10 meters in diameter were not ruled out, because of the ejecta measured in the Surveyor 7 lunar landing site and Apollo 15 , 16 and 17 high-resolution photographs of the moon. According to Masursky and Crabill, "The block populations depend on the number of small craters below the resolution limit that may excavate blocks from below the wind-laid mantle and the number exposed by deflation. Slopes were deemed acceptable based on Earth analogs, except on the inner margins of craters." 68 Hugh Kieffer's infrared thermal-mapping device did not provide conclusive assistance in selecting a site, When the pictures looked good, there were no IRTM data. Where the IRTM gave good results, there were no photographs. For no site were there both photos and IRTM information. From the IRTM, B-2 looked less blocky than B-3, but with the IRTM the latter looked a good deal like Viking 1 's landing point. After nearly two hours of discussion, a dinner break was called. The meeting reconvened at 6:35 p.m. "Is there demonstrated evidence that a significant increment in safety exists in going to B-2 that warrants changing the current plan to go to B-3?" asked Tom Young. Mike Carr thought the larger dunes in B-2 argued for safety, but then so did the effects of wind in B-3. Klein and Biemann favored B-2 because more water might be present for the biology experiment. After a number of other opinions had been expressed, Young called for a show of hands on two questions: "Should we select B-3E/B-2W or continue to search? If we decide on a specific site tonight, should it be B-3E or B-2W?" Of those voting, 28 wanted a site; 9 wished to continue searching. The B-2 site would be chosen by 20, B-3 by 10. Jim Martin concluded the open part of the meeting by requesting Tom Young, Gentry Lee, Jerry Soffen, Carl Sagan, Hal Masursky, Norm Crabill, Mike Carr, Hugh Kieffer, Conway Snyder, Brad Smith, Tim Mutch, and Bob Hargraves to attend an executive session of the Landing Site Staff. Young favored B-3 and enumerated his reasons: (1) Safety-B-3 appeared to be mantled, muted, and filled. With all that cover, it was hard to believe that there could be serious hazards to the lander. Since Carr and others were not particularly confident about B-2 because of the visibility problems, Young liked B-3 better, (2) Science-Young saw limited distinction between the two. B-2 might have a slight edge because of more water and higher temperatures, but those elements did not outweigh the safety differential between the two sites. As Masursky and Crabill pointed out, "The most significant scientific distinction had already been realized when the northern latitude band was selected.'' (3) Operations-The landing would be more straightforward at B-3. To land at B-2 would require additional data analysis, and  that would delay the landing significantly (according to Martin, the delay could be as long as two or three weeks). Such a delay, attended by greater operational complexity, did not seem to be justified by his readings of the two sites. Project Manager Martin agreed with his mission director. He noted that several of the scientists wanted to do more ambitious exercises with the second lander, but he believed that additional observations of B-2 would work an already tired team into the ground. He could not see imposing such a killing load on the flight team. After some brief comments from others, Martin said they would go with B-3. It was safe enough; it had good enough science. There was no radar, but he was willing to take that risk. Gathering around the B-3 east stereo mosaic, the group determined the preliminary coordinates-48.0° north, 226.0°. 69 Final coordinates were chosen on 30 August after reviewing the P20 photographs: 47.89°N, 225.86°. An orbital trim maneuver on 25 August 1976 ended Viking 2 's walk around the planet. Two days later a final trim synchronized the periapsis point relative to the landing site, which was centered 200 kilometers from the crater Mie, Before preseparation checkout of the second spacecraft, mission control put the first lander into the "reduced mission mode," permitting the flight team to concentrate on the second craft, At 9 am PDT on 3 September, the Viking Flight Team met for the "go/no-go'' separation meeting. With the exception of one of the terminal descent radar beams and a gyroscopic stabilizer that had given them some trouble, there were no problems with the spacecraft; all systems were "go" for separation. The radar problem was solved by locking out the troublesome unit, since the lander could touch down with only three of the landing radar beams functioning. And further analysis of the Y-axis gyro led the specialists to believe that it would not give them any trouble. Viking 2 was ready for the big moment-separation and descent to the surface. A landing site for the second Viking lander is chosen in the eastern end of Utopia Planitia, 48°N latitude, 226° longitude. These three photos were taken by the Viking 2 orbiter on 16 August 1976 from 3360 kilometers away. Rough ground and craters appear blanketed by dunes. On 3 September, the world would be able to judge the wisdom of the landing site team's decision. But there were some heart-stopping moments before Viking mission control knew that the lander was on the surface. Confirmation of separation came as scheduled at 12:39:59 p.m. Three seconds later came an indication that the orbiter had been upset. Twenty-six seconds later the power supply to the gyros on the orbiter cut out; the second power unit went out at 12:41:19. Without power, the inertial reference unit, which kept the orbiter aligned properly in space, could no longer control Viking 2 . As the spacecraft began to drift off course, its high-gain antenna lost contact with Earth. Within minutes of the failure, the orbiter's computer sensed the problem and commanded the backup inertial reference unit to take over arid stabilize the attitude of the spacecraft. A view from the Martian north pole shows the location of the two Viking sites. ....and guests waited, subdued, for each little clue that would tell them all was going well. * If the pressure was as high as 7.8 millibars the temperature rose above freezing, liquid water was possible at Cydonia. ** These orbit numbers (periapsides figues) are for the second mission.